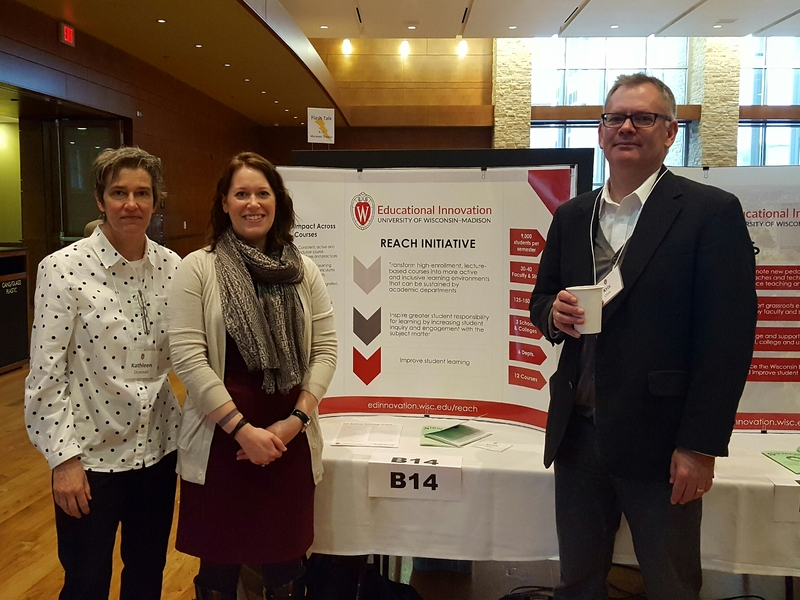 On Wednesday, April 5, 2017, DoIT Academic Technology team members joined hundreds of campus colleagues to share best practices and learn ways to improve processes, learning environments and the campus climate at the 18th Annual UW-Madison Showcase. 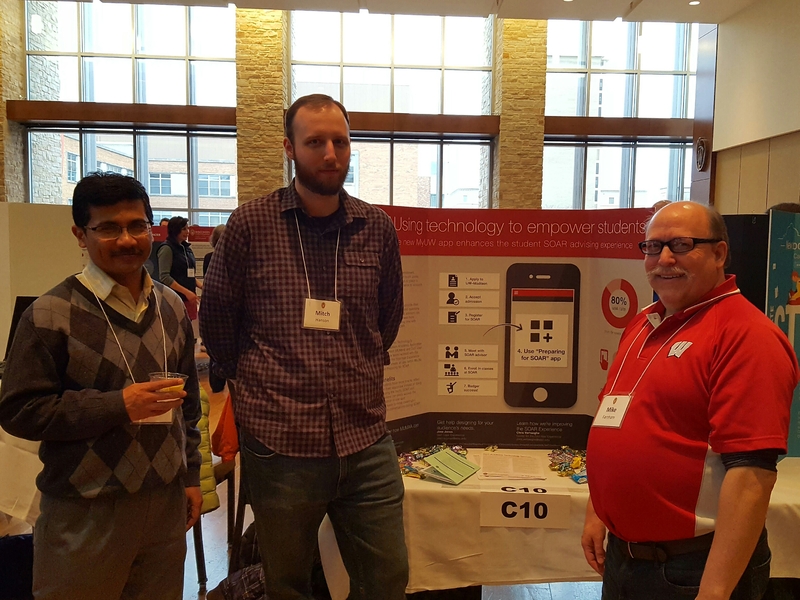 Mike Farnham, Saiket Sengrupta and Mitch Hanson from MyUW-Madison Academic Application Development (MUMAA) presented a poster about the Preparing for SOAR App they developed for the Center for the First-Year Experience (CFYE). 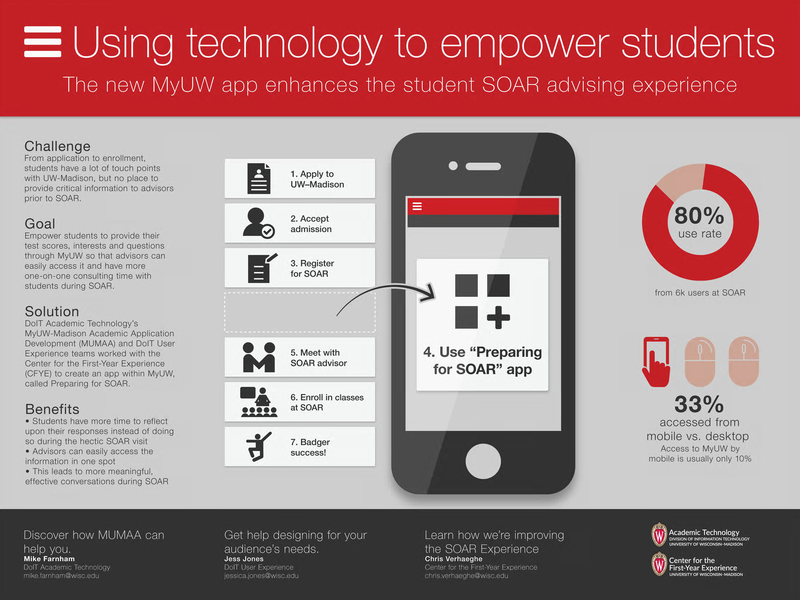 To enhance students’ advising experience at SOAR, MUMAA and Jess Jones from DoIT User Experience developed the MyUW app that empowered students to provide test scores, interests and questions for advisors prior to arriving on campus. The Preparing for SOAR app is only the latest project that MUMAA has collaborated with CFYE on. Nominated by CFYE, MUMAA was named a Campus Partner of the Year by the Dean of Student Life for their work on the SOAR Advising Module (SAM) last year. 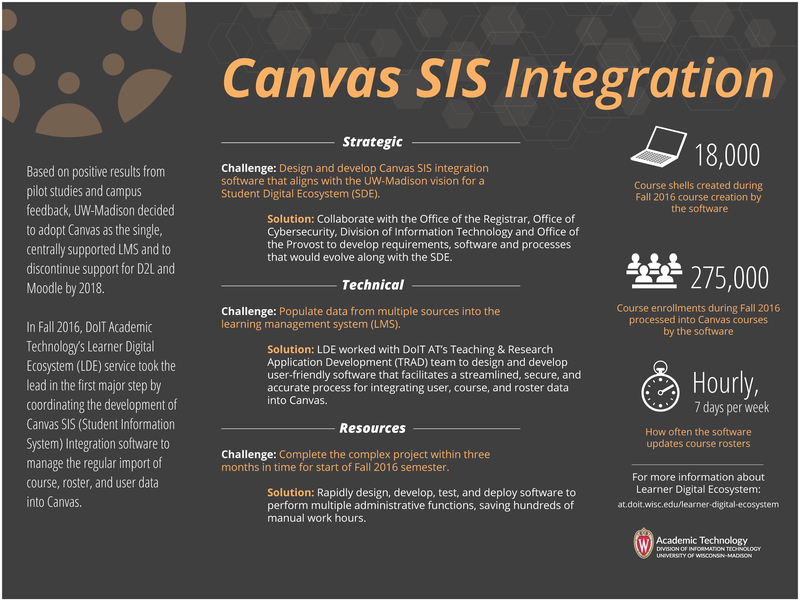 DoIT AT’s newest service, Learner Digital Ecosystem (LDE), exhibited a poster on how the service coordinated the Canvas SIS (Student Information System) Integration software development. Kristy Bergeron, the service leader, was on hand to explain the strategic, technical and resource management logistics involved in developing the software with Teaching & Research Application Development (TRAD) and campus partners like the Office of the Registrar, Office of Cybersecurity and Office of the Provost. The software manages the regular import of course, roster and user data into Canvas including the first 18,000 course shells needed for Fall 2016. Other DoIT AT team members helped our partners present their posters. 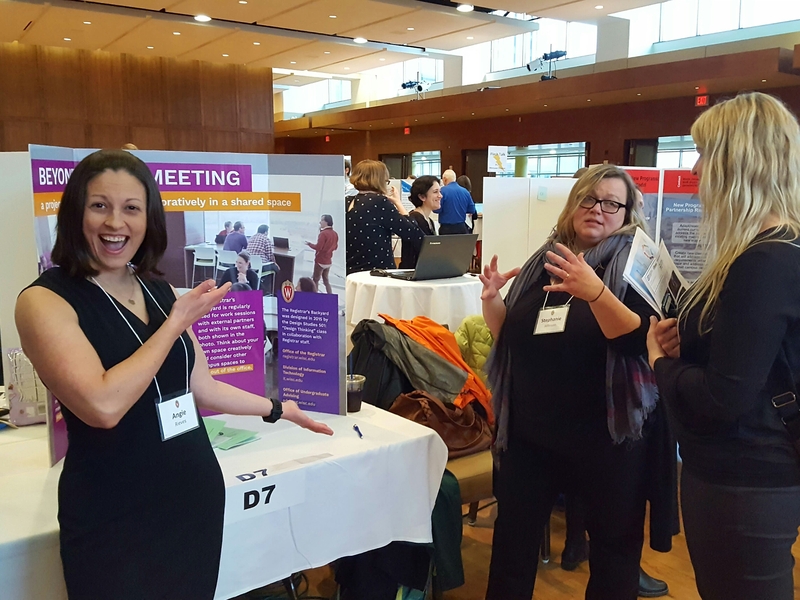 At the REACH poster, Kathleen O’Connell and Theresa Pesavento from Strategic Learning Technology Consulting joined Kris Olds, REACH co-lead and professor at the Department of Geography. Both senior consultants contribute to the REACH program with Kathleen working with the Department of Mathematics and Theresa working with the Department of Chemistry. Chris Lupton and Julie Johnson from Faculty Engagement joined Harry Webne-Behrman from the Office of Human Resources to share how our two groups collaborated on the Communities of Practice Guide. 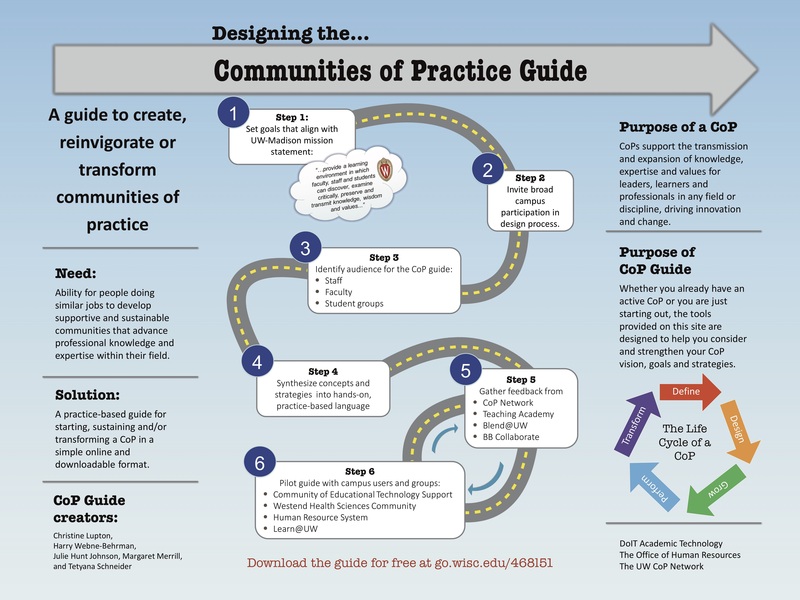 The poster outlines the steps in developing the practice-based guide for starting, sustaining and transforming a Community of Practice. DoIT AT’s project manager, Stephanie Johnson, helped Angie Rieves from the Office of the Registrar introduce campus to the Registrar’s Backyard. Often partnering on Registrar projects, Stephanie has first-hand experience with how the shared space helps project teams work more collaboratively and effectively. See our team in action in the photo gallery below. Saikat Sengupta, Mitch Hanson and Mike Farnham at the Preparing for SOAR App poster. 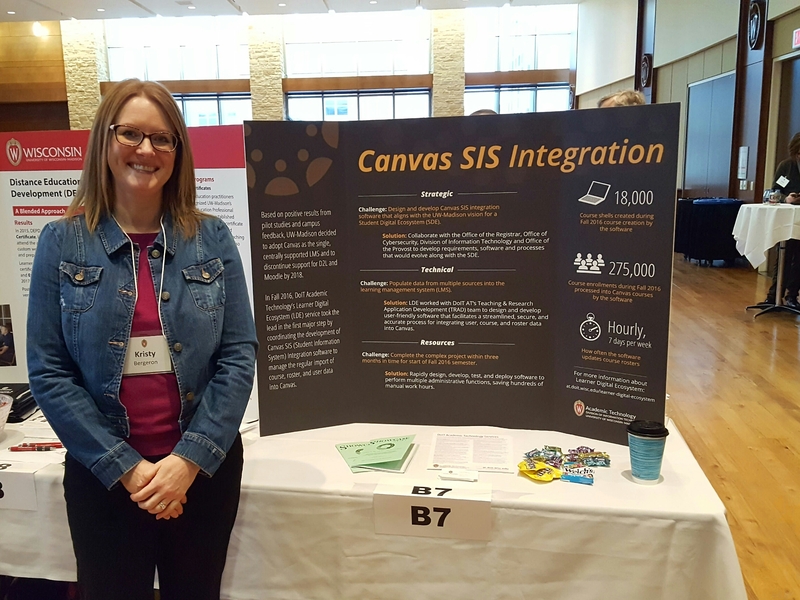 Kristy Bergeron at the Canvas SIS Integration poster. Kathleen O'Connell, Theresa Pesavento and Kris Olds at the REACH poster. 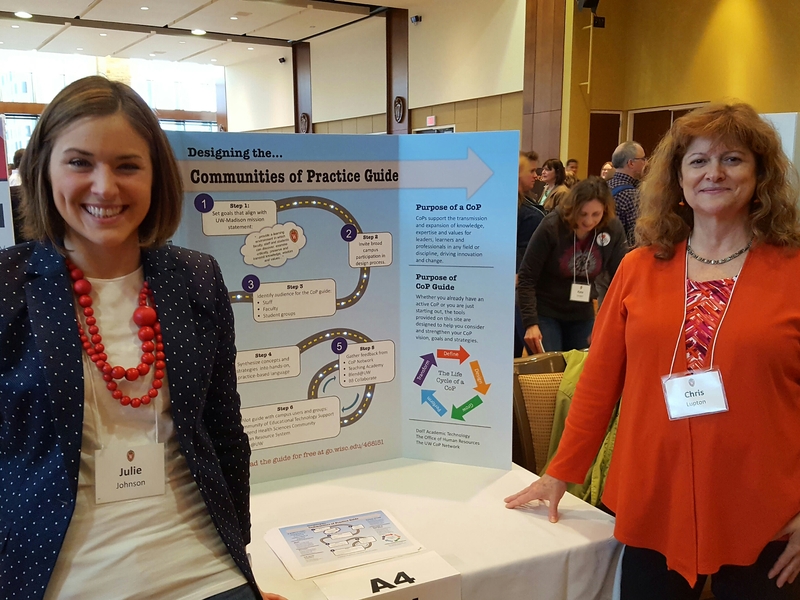 Julie Johnson and Chris Lupton at the Community of Practice Guide poster. Angie Rieves and Stephanie Johnson at the Office of the Registrar poster.